OC Prudent Bear: What Do You Make Out of This? I wrote the following in late October and wasn't going to publish it, but a buddy convinced me to get it out. Sorry it's more than a bit late. 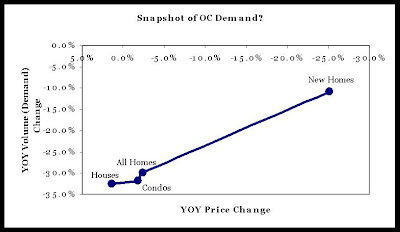 It shows a snapshot of recent year-on-year (YOY) price and volume changes for four segments of OC Real Estate: new homes, existing homes, existing condos and then an 'all' category encompassing the other three. The horizontal axis is used to plot year-on-year price changes ,while the vertical axis plots YOY changes in volume/demand. Thus, line the plots the YOY relative change in demand versus the relative change in price for each of our four housing segments. This first thing I noted on this graph was the fact that prices of new homes had fallen the most of any segment while prices for existent houses had fallen the least. I believe that difference is caused by price different price 'stickiness' between those to segements and that prices for new homes are more 'fluid' and reponsive to market changes than prices for existing homes. Put another way, prices for new homes have dropped more YOY because builders have done more to adjust their prices to reflect today's market conditions than their homeowners counterparts. Why? Builders generally have a specified period of time in which they want to sell their inventory of homes. A homeowner, who is not in a distressed situation, may choose to sell or to wait (wisely or not) to get a 'better' price in the future. The getting a lower price for a home has a far smaller impact on a build that a homeowner. For a builder to get a lower price on a house may mean a difference of .00025% in the equity position of a builder. While if an owner takes a 10% loss on a single house, that may mean a loss of 25% or more of his net worth. That's a tough pill to swallow. Many homeowners have to get a certain amount for their house for practical reasons, for example to buy a trade-up house, pay-off their mortgage or avoid a shortsale. Builders have no such constraint. Builders are dispassionate in their pricing decisions, pricing their homes in order to sell the homes in inventory. Homeowners are often heavily emotionally involved, pricing their to get as much as the guy down the street, x% over what they paid or acheive some other emotionally-satisfying threshold. With all of these factors working together, home prices for builders have already adjusted to today's market conditions, where prices for homeowners are still lagging, probably by several months. It is my contention is that it is only a matter of time before homeowners' prices catch up with builders' prices. "Theory and speculation!" you might say. "You're comparing apples (new homes) to oranges (existing homes)", you might say and you might be right. But on the other hand, if new and resale houses are more or less interchangable in a buyer's mind, resale houses in order to catch up to their prior sales pace are going to have to decline appreciably and maybe by as much as 30%. After all, new homes are down 25% and they're still down 10% in volume. Smart sellers are going to beat the neighbors to the punch and price their homes very aggressively. Those that don't will suffer the death of a "thousand pricing cuts", trimming prices here and there a little at a time until the market bottoms and they get bottom dollar for their homes. Smart buyers are waiting to buy all together or negotiating extremely aggressively on price, conditons, terms, services of any deal and only buying where the own/buy cost ratio is reasonable. I don't agree with this analysis. Newer homes are MORE attractive than existing homes for many reasons. Resale homes are going to have to drop more than new homes for demand to go up. In general I think you're rright.